The earliest footprints showing evidence of modern human foot anatomy and gait have been unearthed in Kenya. The 1.5-million-year-old footprints display signs of a pronounced arch and short, aligned toes, in contrast to older footprints. The size and spacing of the Kenyan markings - attributed to Homo erectus - reflect the height, weight, and walking style of modern humans. 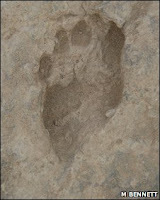 The footprints are not the oldest belonging to a member of the human lineage. That title belongs to the 3.7 million-year-old Australopithecus afarensis prints found in Laetoli, Tanzania, in 1978. Those prints, however, showed comparatively flat feet and a significantly higher angle between the big toe and the other toes, representative of a foot still adapted to grasping. Exactly how that more ape-like foot developed into its modern version has remained unclear. The fossil record is distinctly lacking in foot and hand bones, according to lead author Matthew Bennett of Bournemouth University, UK. "The reason is that carnivores like to eat hands and feet," Professor Bennett told BBC News. "Once the flesh is gone there's a lot of little bones that don't get preserved, so we know very little about the evolution of hands and feet on our ancestors." The footprints were found near Ileret in northern Kenya. The site, on a small hill, is made up of metres of sediment which the researchers carefully cleared away. What they found was two sets of footprints, one five metres deeper than the other, separated by sand, silt, and volcanic ash. The team dated the surrounding sediment by comparing it with well-known radioisotope-dated samples from the region, finding that the two layers of prints were made at least 10,000 years apart. Another critical feature that the series of footprints makes clear is how Homo erectus walked. There is evidence of a heavy landing on the heel with weight transferred along the outer edge of the foot, progressing to the ball of the foot and lifting off with the toes. "That's very diagnostic of the modern style of walking, and the Laetoli prints don't give that same character," Professor Bennett said. The finding is a critical clue for mapping out the evolution of modern humans, both in terms of physiology and also how H. erectus fared in its environment. H. erectus was a great leap in evolution, showing increased variety of diet and of habitat, and was the first Homo species to make the journey out of Africa. "There's some suggestion out there that Homo erectus was able to scour the landscape for carcasses and meat...and was able to get there very quickly, had longer limbs and was much more efficient in terms of long distance travel," Professor Bennett added. "Now we're also saying it had an essentially modern foot anatomy and function, which also adds to that story."